We are the large brick building located at the intersection of Rt 62 and Rt 28 in North Reading, MA. 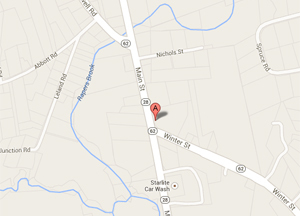 Our street address is 123 Main Street, North Reading, Massachusetts. We have plenty of free parking in our parking lot that can be accessed from both Rt 62 and Rt 28.